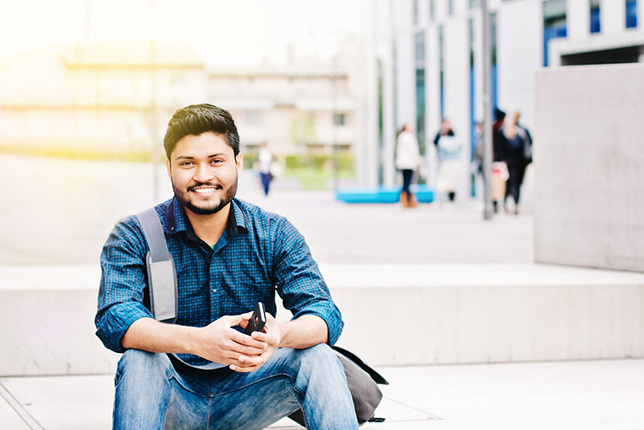 Three out of four college and university students think technology has had a positive impact on their academic success, according to a recent survey. Their preferred tech tools are laptops and smartphones, and they look to their institutions to provide the software applications and resources they need. And most are satisfied with the variety of IT resources available to them. Those findings and more came out of a SurveyMonkey Audience study of 601 U.S. adults ages 18–44 who are currently enrolled as students in two-year, four-year or graduate school programs. The survey was conducted from Sept. 9–11, 2017; respondents came from an online SurveyMonkey Contribute panel of people who volunteer to complete SurveyMonkey surveys each month in return for charitable incentives. The survey revealed a wealth of insights into students' use of computing devices, attitude toward technology and awareness of campus resources. More than half (54 percent) of students surveyed bring at least two internet-connected devices with them to campus. Another 22 percent bring three to four devices. Nearly all students (92 percent) use smartphones on campus; 72 percent use laptops, 23 percent use tablets. Notably, 53 percent of respondents took the survey on a mobile device (iOS or Android phone/tablet). Forty-two percent of students are very satisfied or somewhat satisfied with the support their school provides for mobile devices, although 26 percent have never sought institutional IT support for their smartphone or tablet. In general, nearly a quarter of students (22 percent) said they never utilize IT support or the help desk at their school. Sixty-nine percent go to IT for help rarely or occasionally, while 8 percent get support frequently or very often. The majority of students (66 percent) said their overall technology experience at school has been excellent or good. What's more, most students (75 percent) said technology has had a significantly positive or positive impact on their academic success. Just 3 percent said the opposite. 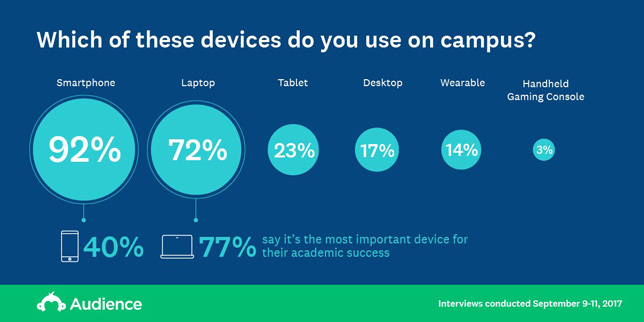 Out of all students who bring at least two devices with them to campus, 76 percent said their laptops contribute most to their academic success; 40 percent thought their smartphones were most important to their studies. Only 12 percent cited tablets, and 9 percent cited desktop computers. 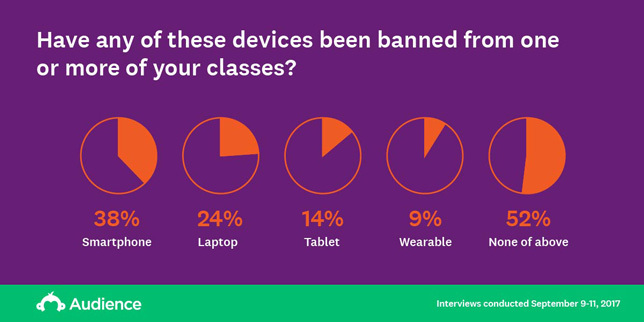 However, 24 percent of students said laptops are banned from one or more of their classes, while 38 percent are restricted from using smartphones. Students think software makes a difference too: Having "the right software applications" offered in school improves the quality of student work (cited by 67 percent of respondents), increases student productivity (66 percent), facilitates student collaboration (48 percent) and aids collaboration with faculty (39 percent). Eighty percent of students feel their school has provided all the software they need to be successful. "My university provides a lot of free software applications and integrates them into the classroom," wrote one student. "If we were forced to pay for the software, I would not be able to afford them and in result fail my classes. Access to this free technology has definitely prepared me for my future." Half of all students use their school's software applications and resources at least once a week. Sixty-one percent are satisfied or very satisfied with the variety of resources available to them, and while 30 percent are neutral about the issue, only 9 percent feel dissatisfied or very dissatisfied. Where do students find or access the technology resources provided by their school? The number one source was instructors in class (cited by 59 percent of respondents), followed by the online portal (51 percent), searching the college/university website (47 percent) and other students (40 percent). Seventy percent of students said it's easy or very easy to get access to available software (via username/password/login link) when needed. When choosing a new software application for academic purposes, top factors for students include ease of use (cited by 75 percent of students), instant access (54 percent), mobile compatibility (52 percent) and security features (40 percent). If the institution does not provide needed software, 51 percent of students will download a free application. Forty-five percent will purchase a paid application, and 40 percent will just go without. Eighteen percent will download a pirated copy, while 14 percent will request the software from the IT department. Students are more likely to say that technology provided by their school has had no impact on their academic success, and less likely to feel that their school has provided them with all the software they need to be successful.